One of the toughest things about utilizing your writing skills to earn a living working from home is having a steady workflow. There always seems to be periods when you can’t keep up with the number of writing projects coming in, then there are other weeks where you’re lucky if you land one project. That’s why it’s always good to be open to other writing opportunities such as Writers Needed. How to Apply with Writers Needed? It is a very simple process when applying with Writers Needed. The great thing about this company is no lengthy tests are required to be considered for a spot. It is as simple as filling out their online application which takes a few minutes, attaching a few writing samples, and waiting for them to them to reach out to you. They usually respond within 24 hours, however on the weekends or holidays it may take a little longer of they have several applications. How much does Writers Needed pay? 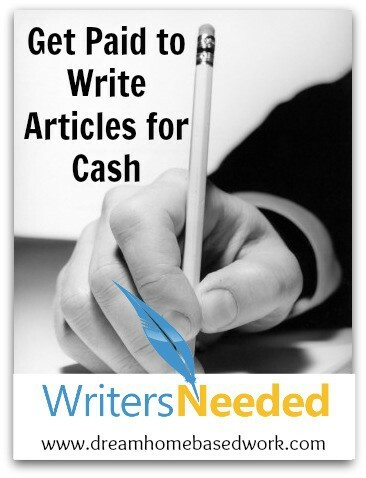 Writers Needed pays anywhere from $11 to $13 for each article submission. They are similar to Blogmutt, which is a well-respected site that offers a great deal or work, but only pays $8 per detailed article. Writers Needed expects their writers to deliver a minimum of 300 word long articles. As a writer, you are paid every two weeks, and payments will be deposited into your PayPal account. One of the things you will really like about the website is that you don’t have to write articles and cross your fingers, hoping the client will like them. The way their writing program is set up, you can communicate directly with the client ( anonymously), and learn as much about the type of articles they prefer, and ask any questions about the topic you're writing about. Another thing you will love is the steady amount of work available, making it a reliable source of income when you have a little spare time. This can also be an alternative when other sources of work at home income has run dry. If you have great writing skills, send Writers Needed your application and writing samples. I think you’ will love the with the results. If you have worked for Writers Needed, share your experience in my comment section below! Thanks!